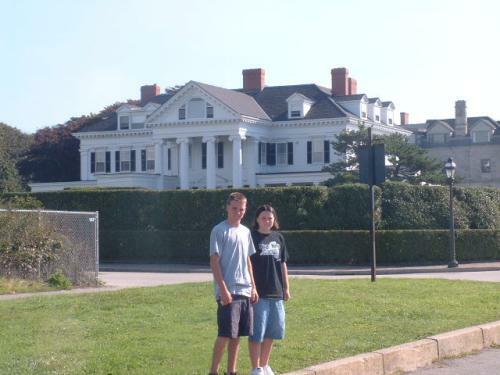 I had wanted for a long time to have Colin and Marissa see the great mansions of Newport, Rhode Island. Marissa, in particular, has really enjoyed visiting historic homes on previous vacations and when I told her about it she was really interested. Colin also showed a keen interest. So, I set it up with their teachers to miss a couple days of school so we would have enough time to do it justice. We arrived at the Howard Johnson's in Middletown, RI around 1pm. We were lucky as the room was ready so we moved right in! I had picked the Howard Johnson's as it had an indoor pool and Applebee's restaurant was attached. How can you go wrong with that? The desk clerk told us to take 214 South into Newport to avoid all the traffic on 114. Great suggestion as it only took about 10 minutes to get to the famous Bellevue Avenue along which many of the mansions are located. Anyway, we dumped the bags on the floor and headed into Newport to see Chateau-Sur-Mer. 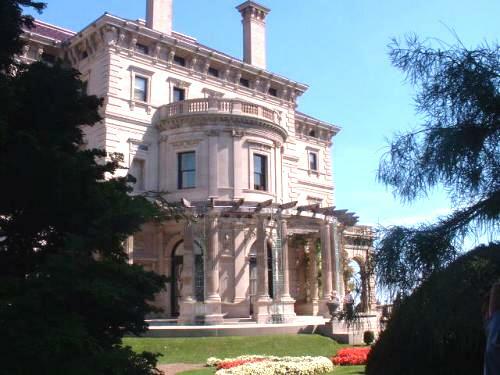 This property - as many of the mansions that we visited - is maintained by the Newport Mansions preservation society (http://www.newportmansions.org/), and is one of the best examples of lavish Victorian architecture in America. We all just thought is was beautiful. The kids just couldn't believe it. Both Marissa and I forgot to bring our cameras, so we have no shots. Too bad as it is a beautiful mansion and not to be missed. After that, we came back to the motel and jumped into the pool for a swim. Great pool area, too! Well lit and a terrific hot tub that I took advantage of a few times during our stay. Friday 09/24/04: We slept in Friday morning and didn't arise until around 9:30. I was pooped and could have slept another 3 hours. But the day beckoned! No one was interested in breakfast, so we stopped at a 7-Eleven convenience store and got juice drinks and (ugh! Guilty…) donuts. 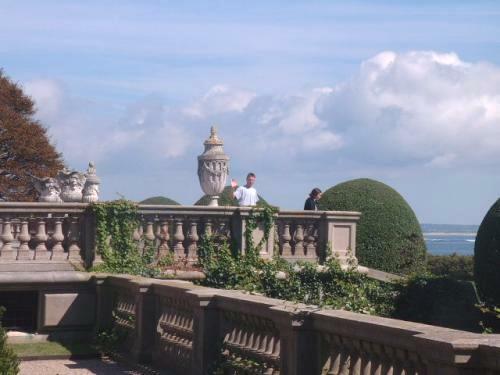 I wanted to start with Rosecliff, but it never did seem to open that day the few times we drove by. So, we went to the Marble House first. 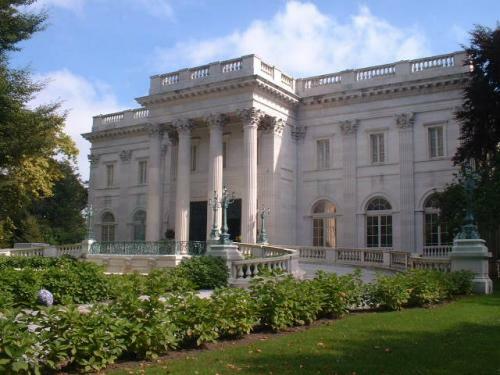 The Marble House is one of the most sumptuous of Newport's cottages. It takes its name from the many kinds of marble used in its construction and decoration. There is a colorful Chinese Teahouse that overlooks the Atlantic Ocean. The guys were awe struck with the whole thing. We got some great pictures of the outside because the weather just could not have been any better - and for the entire stay! It was funny because Marissa had insisted on getting her own disposable camera so she could have her own pictures. And she took quite a few at Marble House that's for sure! Then we were off to see The Elms. 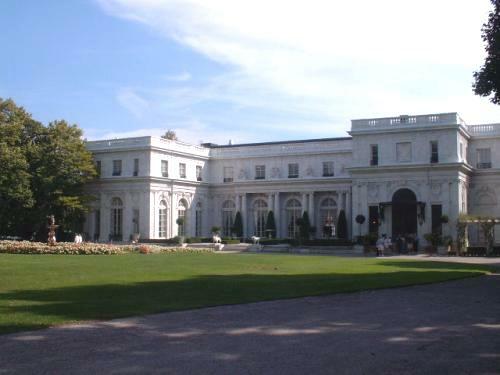 The Elms was built in 1901 as a summer residence for Edward J. Berwind, a Philadelphia coal magnate. It was modeled after the Chateau d'Asnires near Paris. Again, another breathtaking experience. By the time we got out of Elms, it was afternoon so we headed down to Newport Harbor for lunch. Colin's friend Roger had taken him to the famous Black Pearl for lunch a few weeks before when they had been down to the boat show and he wanted to go back. So that's where we headed. Colin had his eyes on a repeat hamburger and he went right through it. It was ok. I had been there 19 years ago and it was ok then too. The flies are a nuisance and detract from an otherwise cozy dining room. And lunch cost more than last night's dinner. Oh well. We're on vacation and we don't care! Marissa wanted to get a Newport sweatshirt and found exactly what she wanted at a cart vendor for $10. She snatched that right up and we were off on another adventure to see The Breakers. 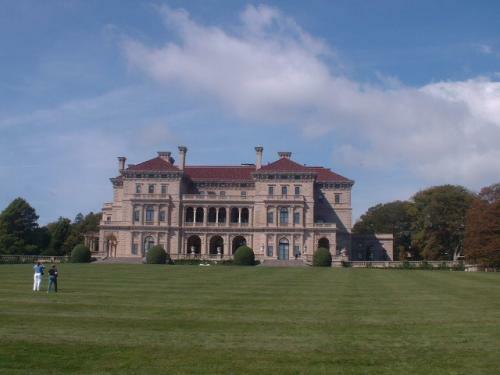 The Breakers is the largest of Newport's summer residences or "cottages". 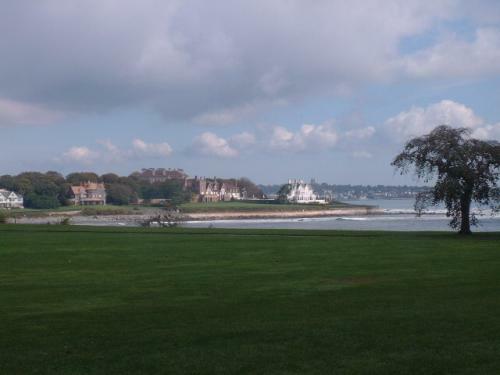 It is on the southern end of Ochre Point Ave. in a beautiful area of Newport. 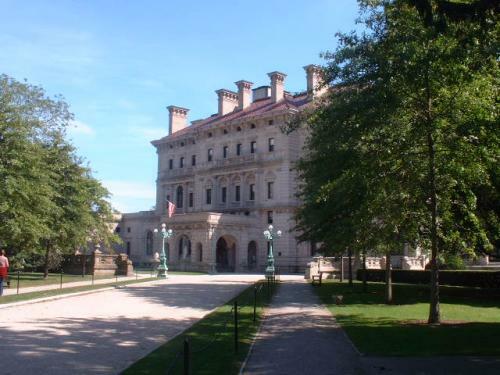 It was built for Cornelius Vanderbilt by Richard Morris Hunt as a copy of an Italian Palace. It took our breath away as we were ushered into the center reception area of the house - a perfect cube 50 feet on a side. Unbelievable wealth. To say that this room is spectacular is an understatement. It was the most breathtaking thing I think I have ever seen. And Colin and Marissa were just speechless. In fact, so much of a breathtaking experience after we toured The Breakers and its magnificent grounds that we called it a day and headed back to Howard Johnson's for a swim in the pool. I had bought a couple of picture travel books on Tuscany, so after I soaked in the hot tub for awhile, I started reading one of them. Then we headed back to the room. Marissa and I played some fierce backgammon, and then the vote was to go to Chili's for dinner. After that it was our second movie pick A Man Apart with Vin Diesel. Very action oriented and captured the attention of the troops with no problem, though many jaded comments about the previous evening's movie selection and the selector in particular... We closed up shop at 11pm and never came to until 9am. Saturday 09/25/04: We had wanted to do a real breakfast this morning but it was getting late. Applebee's had listed a special continental breakfast for Howard Johnson's patrons but no one was interested in that. The vote was for a full breakfast. We headed into Newport, but everywhere we looked the lines were impossible. So, back to Middletown we went. But, do you think we could find a breakfast place? Nope. So, Colin and I did Dunkin Donuts and Marissa opted for a fruit drink at 7-Eleven. And we were off to a late start to our touring! First up was Rosecliff. Built in 1902 in Newport's Gilded Age for Mrs. Hermann Oelrichs, this terracotta mansion is well-fitted for brilliant entertainments. And it sure looked like you could hold a great party there! Next, we went to Belcourt Castle which is a French style castle in the Louis XII style. 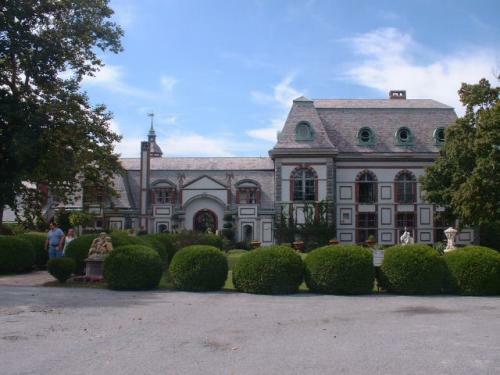 It was built in 1891 - 1894 for Oliver Hazard Perry Belmont (who interestingly married the divorced Mrs. William K. Vanderbilt). It has an unbelievable collection of art and antiques from 32 European and Oriental countries. The castle is actually owned and occupied as a residence by the Tinney family who open it for the public to tour. I had remembered how pretty the scenery along Ocean Drive was and suggested it to the kids. We stumbled into a kite flying club at Benton Park so we stopped there for awhile to check it out. 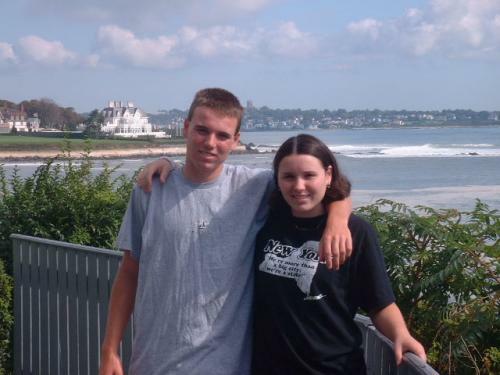 Marissa wanted to see what Fort Adams was all about, so we swung in there. 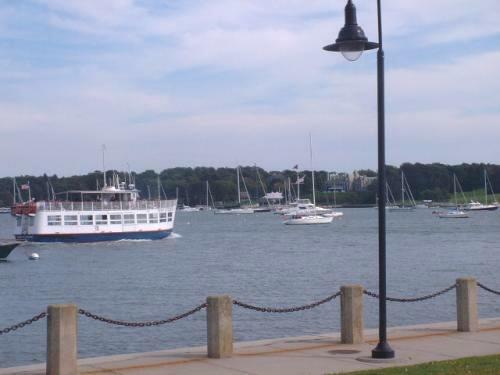 It's a beautiful drive past the marinas along the harbor and out to the point. Fort Adams is the largest coastal fortification in the United States with a 6 acre parade field enclosed within the walls of the fort. We had a great hour tour through the fort, and again it just couldn't have been better weather. After soaking in the hot tub for awhile, there was a flurry of backgammon games while re-watching A Man Apart, a huge hit with the fans. Applebee's was also a big hit, and so we went there again for dinner by unanimous vote. We had a nice very leisurely dinner and enjoyable conversation. Then back to the room for the movie Traffic. We agreed to calling it an early night so that we could get on the road and back home by around noon. Smooth ride back; perfect end to a wonderful time together. 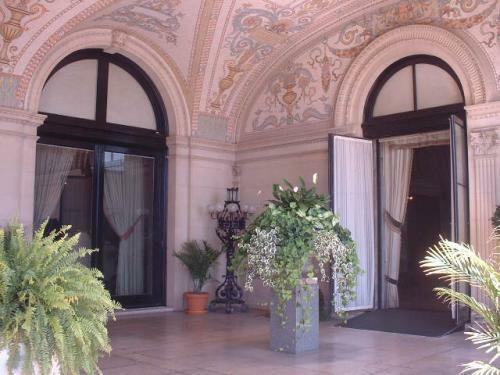 A great shot of the entrance to Marble House. 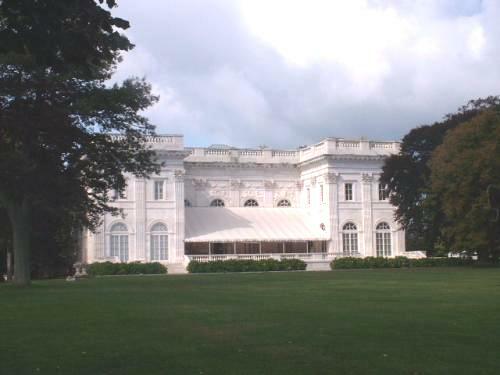 Side view of Marble House. 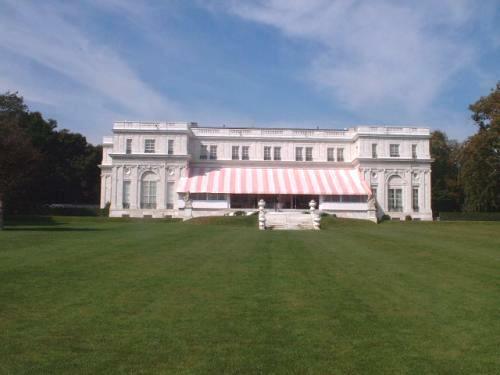 A view of Marble House's rear porch area. 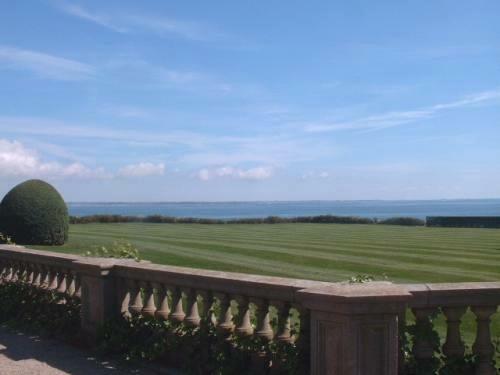 Looking toward the shore from Marble House's rear lawn. 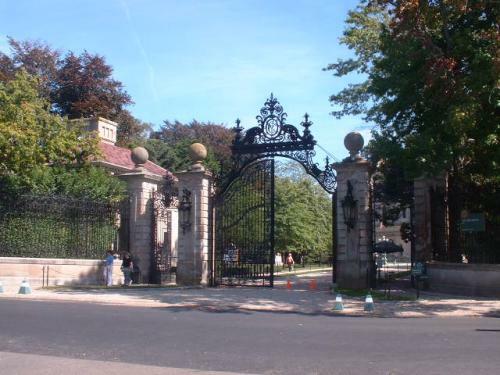 This is the entrance gate to Vanderbilt's Breakers mansion. Colin and Marissa on the back patio of The Breakers. Looking toward the ocean from the rear of the Breakers. 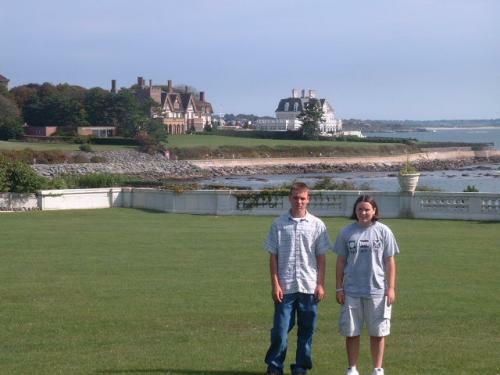 Colin and Marissa out on the rear lawn of The Breakers. Looking at the front of The Elms mansion. A view toward the rear of The Elms. 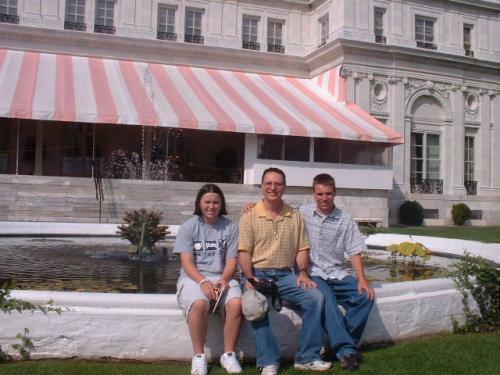 We took a couple's picture for them, and they returned the favor by taking this shot of the three of us sitting by the fountain in the rear patio of The Elms mansion! This is a nice view of the front of Belcourt Castle. 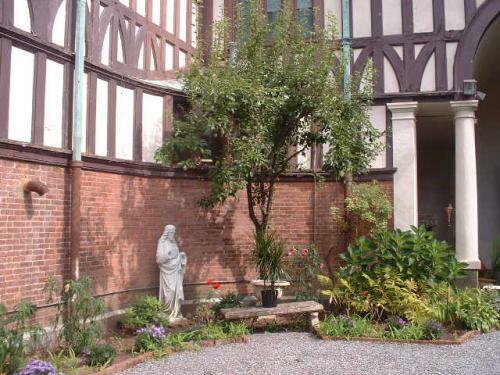 I just loved the feeling of this landscaping in the courtyard of Belcourt Castle. 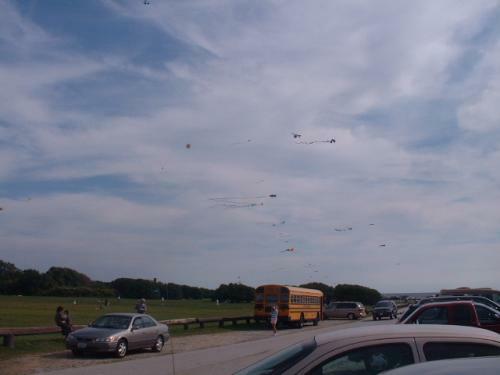 As we drove down Ocean Avenue along the coast, we saw these kites from the distance and stopped at Benton Park to watch them for awhile. 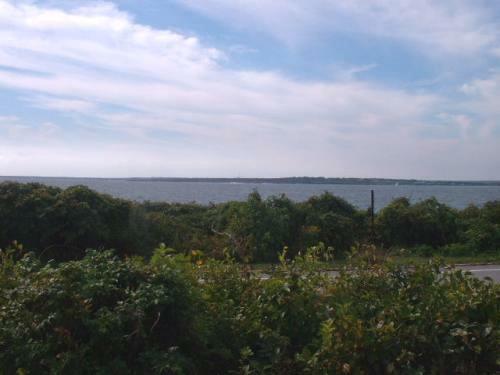 This is a view toward the mouth of Narragansett Bay	from Benton Park. This is the waterfront harbor on the way out to Fort Adams. 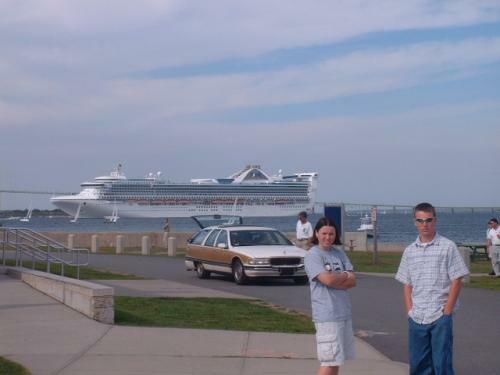 We were amazed to see this cruise ship in the background and so I snapped this picture of Colin and Marissa. The ticket counter for Fort Adams is just to the left, as is the fort itself.